Saint Veronica's parents were peasants of a village near Milan. From her childhood she toiled hard in the house and the field, and accomplished cheerfully every menial task. Gradually the desire for perfection grew within her; she became deaf to the jokes and songs of her companions, and sometimes, when reaping and hoeing, would hide her face and weep. Untaught, she began to be anxious about her lack of instruction, and rose secretly at night to try to learn to read. Our Lady told her that other things were necessary, but not this: My daughter, do not be anxious, it will be sufficient for you to know the three letters that I bring you from heaven. The first is purity of heart, which makes us love God above all things; you must have only one love, that of My Son. The second is not to murmur against the faults of your neighbor, but to support them with patience and pray for the one in question. The third is to meditate every day on the Passion of Jesus Christ, who accepts you for His spouse. 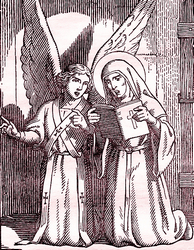 After three years' patient waiting she was received as a lay-sister in the convent of Saint Martha at Milan. The community was extremely poor, and Veronica's duty was to beg throughout the city for their daily food. Three years after receiving the religious habit she was afflicted with constant bodily pains, yet never would consent to be relieved of any of her labors, or to omit one of her prayers. By exact obedience she became a living copy of her rule, and obeyed with a smile the slightest wish of her Superior. She sought until the last the hardest and most humble occupations, and in their performance enjoyed some of the highest favors ever granted to Saints. By the first letter taught her by Our Lady, Saint Veronica learned to begin her daily duties for no human motive, but for God alone; by the second, to carry out what she had thus begun by attending to her own affairs, never judging her neighbor, but praying for those who manifestly lacked virtue; by the third she was enabled to forget her own pains and sorrows in those of her Lord, and to weep hourly, but silently, over the memory of the wrongs He suffered. She had constant ecstasies, and saw in successive visions the whole life of Jesus, and many other mysteries. Yet, by a special grace, neither her raptures nor her tears ever interrupted her labors, which ended only with death. She died in 1497, on the day she had foretold, after a six months' illness, in the thirtieth year of her religious profession. Reflection. When Saint Veronica was urged in sickness to accept some exemption from her labors, her answer was, I must work while I can, while I have time. Dare we, then, waste ours?